Stadium Financing County bond issue paid for Arrowhead Stadium and Kauffman Stadium (home of MLB Kansas City Royals). "Since it was dedicated on August 12, 1972, Kansas City's Arrowhead Stadium has been one of the jewels in the crown of NFL stadiums. It looks even better today than it did when it opened, and the sleek design means there isn't a bad seat in the house. It's hard to imagine in this glittering era that the Chiefs once had a down time. In those days, as former All-Pro nose tackle Bill Mass remembers, "I went into a gas station and left my car unlocked. I had four tickets on the dash, and I came back out and you'll never believe what happened - there were eight tickets on the dash. Perhaps the lowest day in Chiefs' history came on January 2, 1983, when they drew 11,902 fans to a season ending 37-13 win over the New York Jets. On that same day, the now defunct Kansas City Comets of the Major Indoor Soccer League attracted 15,000 to their game at Kemper Arena. Times have changed. As a waiting list for season tickets grows, fans pack Arrowhead Stadium to cheer a team that has reached the playoffs every year since 1990. They wear red and gold, wave their banners and pound their tom-toms. While they can be rowdy, it's a good natured rowdiness preserved by Arrowhead's strict policing of drunkenness and obscenity. Arrowhead is one of the league's loudest stadiums and one of the most exciting places to watch a professional football game." In the late 1960's, after design and seating capacity concerns caused plans for a single, multi-purpose domed stadium to be scrapped, Kansas City opted to construct two separate stadiums, one for football and one for baseball. Voters approved the Sports Complex bond issue in 1967, which including plans for a revolutionary concept - the world's first rolling stadium roof. 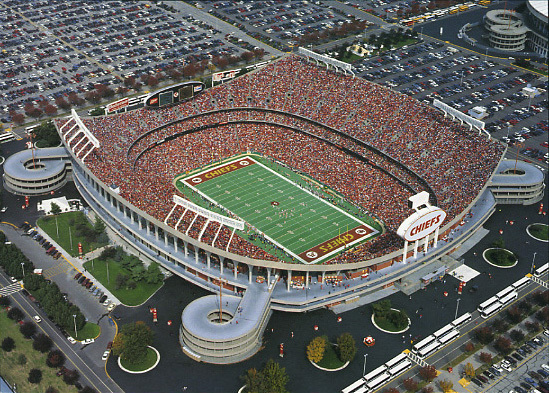 Construction cost overruns and project delays caused by a lengthy strike eventually forced the roof concept to be put on hold, but Arrowhead was completed in time for the 1972 season. In 1984, the Jackson County Sports Authority again investigated the feasibility of a dome - this time made of fabric - but that concept too was shelved as being unnecessary and financially impractical. 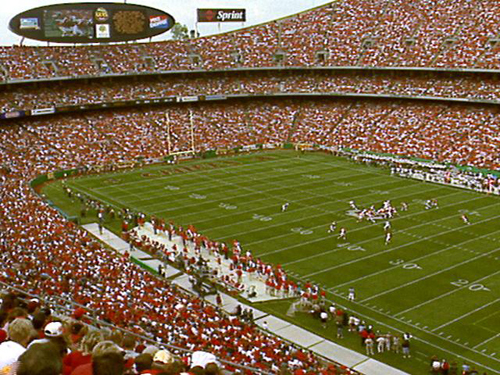 A decade later in 1994, under Arrowhead's continued open-air arrangement, a natural playing surface was installed in the facility for the first time, just one of numerous improvements which have been made under the seven-year direction of Chiefs President, General Manager, and CEO, Carl Peterson. 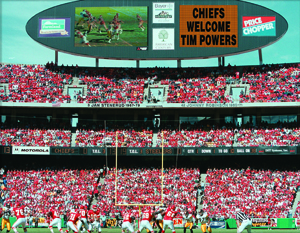 In 1991, a state-of-the-art JumboTron screen was installed, and from 1994 96 other multi-million dollar projects have modernized and expanded the Arrowhead Club, the Chiefs team and office facilities, as well as the stadium's concession areas. Undoubtedly one of the finest facilities in the NFL, Arrowhead and the fans who consistently fill it (43 consecutive sell-outs) have helped produce a distinct home-field advantage for the Chiefs. Since 1992, no NFL team has a better regular season home winning percentage than Kansas City, which has an incredible 27-5 (.844) record. Nearly 30 years after the first plans were being devised for Kansas City's unique two stadium set-up, other metropolitan areas including Cincinnati and Baltimore are, only now, in the process of attempting to construct similar facilities. On the eve of the 1996 season, Chiefs Founder, Lamar Hunt, expressed the organization's thanks to Colorado-based architect, Charles Deaton, who conceived the two stadium concept. Hunt praised the governmental bodies who took the initiative, and the workers who built Arrowhead, as well as the support of the Jackson County taxpayers who financed this future venture. Hunt pointed out that Kansas City's franchise and its fans have now enjoyed America's top football facility for 25 years and that the Silver Anniversary season is an opportunity for the Chiefs organization to collectively express a hearty salute to all who have unquestionably made Arrowhead Stadium - The Home of the CHIEFS! October 2, 2000 - Driving around Kansas City Prior to getting to Arrowhead, we did drop by Kemper Arena, where the NHL Scouts and the NBA Kings once called this facility home... this venue now is the home of an IHL team and various minor league teams. Once inside, we were impressed with the sleekness and modernness of the building. Of course, no suites, no club seats, yadda yadda... obviously built for a different era. The outside of building looked very cool and modern, but no identifying signage at all, and the arena was built in the middle of a rail yard and industrial park.. uggh what an awful location! Arrowhead Stadium and Ewing Kaufman Stadium (home of the Royals) were both built in the eartly 70s, when everyone else was building cookie cutter round stadiums... in hindsight this decision was sheer genius! Both facilities are nearly 30 years old, yet they look modern and are designed to still cater to the needs of the public and their franchises today. Arrowhead is built with sleek architectural lines making a distinctive upper deck - seats are the teams colors, and jumbotrons adorn each end of the field. The tailgating scene here is awesome, rivaling our Bills crowd in Orchard Park. Traffic ingress and egress is kind of bad though, and we had a long wait to get out of the lot and onto the expressway.. The best item of note here is the famous Kansas City Barbecue.. on sale in each corner of the lower level. The lines were so long we skipped it. Too bad! Arrowhead has an extensive "ring of fame" around the deck walls listing all the Chief's greats. Being a Monday night game of course added electricity to the affair, and the Chiefs did an extensive fireworks show prior to the game. Also, kind of a cool thing - at the end of the national anthem, the crowd substitutes the word "Chiefs" for the word "brave" at the end of the song and shouts it out. These folks bill themselves as "the loudest stadium in the NFL". Well there are those who talk the talk and others who walk the walk. Like most NFL games this place is loud, but nowhere near the loudest we have heard. Cool Chant....during the slow part of Rock and Roll Part II ( you know... da da DA DUH....Hey!) The entire stadium chants " we're gonna beat the hell outta you,you....you,you,you!!!" For a 30 year old stadium this place has worn very well. If we were doing this same odyssey back in the mid 70s we probably would have named this as the best venue. Still one of the greatest sports experiences in the midwest, and this stadium will be around for a long time to come. Kansas City, Mo. - The Kansas City Chiefs have entered into an agreement with IMG, a global sports and entertainment company, to pursue a sponsor for naming rights to Arrowhead Stadium. But the desire of the late Chiefs founder Lamar Hunt will be honored. Whatever corporate name is adopted by the stadium, which opened in 1972, "Arrowhead" will be included. "As we go down the path of bringing in a partner on the field, we would like to keep Arrowhead part of the name," said Chiefs chairman Clark Hunt. The Chiefs hope to secure a long-term naming-rights deal worth $5.5 million a year for the stadium and $800,000 for the practice facility, said Bill Newman, the Chiefs senior vice president/administration. Newman said the lease with Jackson County "does provide the team is entitled to any and all rights fees that we are able to attract." The Chiefs previously had an agreement with Premier Sports Marketing to help secure a naming-rights holder, but that deal expired. Gary Pluchino, senior vice president of IMG, will oversee the project from New York City. IMG also will manage a Kansas City-based sales and marketing team that will work full time with the Chiefs organization. Arrowhead is in the midst of a $375 million renovation project, scheduled to be completed by 2010. With more than 77,000 seats, it is the third-largest stadium in the NFL. The Chiefs have ranked among the top three teams in attendance for nearly 20 years, which means more than 750,000 fans at the stadium and millions more on television will be exposed to the corporate sponsor's name each game.